British scientist Stephen Hawking is one more atheist trying to tell us there is no God. 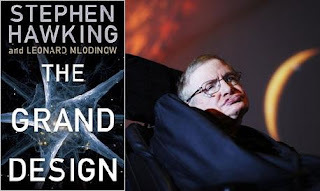 In his new book, The Grand Design, Hawking contends, “Because there is a law such as gravity, the universe can and will create itself from nothing. Spontaneous creation is the reason there is something rather than nothing, why the universe exists, why we exist.” For him, the “Big Bang” was an inevitable result of the laws of physics. Thus “spontaneous creation” did the job without any need for God. For the professor, there is a choice: to believe a God caused creation “for reasons we can’t understand” or that “a law of science,” which he presumably does understand, fused the creation. Thus we have the basic formula of the evolution theory: science is God. Moreover, a personal Creator God is the fantasy of dimwitted crackpots. And there’s the rub. Here we are, mired in confusion and surrounded by enigmas, with no one to talk to. In the current swamp of political correctness, politicians and big thinkers are taking a crack at proffering their own, somewhat subtler, variations of the Hawking formula that are just as deadly. Truth is, if a Higher Authority were not available, there would be compelling evidence that the creation inhabited by men of vastly differing convictions and agendas would self-destruct. If we were, in fact, alone on an orbiting molten mass covered by a thin carpet of clay — a Godless void — we would be doomed. If that scenario is the best the scientific elite can deliver, they can give us nothing at all — certainly not a better, enlightened world. The good news is there is an alternative to despair and a dead-end view of our existence. Several years ago, an Orthodox Jew surveyed the seemingly endless struggle for Middle East peace and declared, “If God does not step in and save us, there is no hope for the future.” He was correct. As I’m writing this, the main players in the Mideast peace talks are meeting in Washington, DC, in the hope of starting negotiations that could lead to a settlement. As they began their low-expectations deliberations, loud protests were already coming from Arab and Islamist elements declaring there would never be peace with Israel; and Hamas terrorists made their point by murdering four innocent Jewish residents of Judea. Furthermore, Palestinian Authority President Mahmoud Abbas declared that, should Israelis resume construction of living quarters in what Arabs call the “occupied territories,” including Jerusalem, talks would immediately end. In the whole fabric of conflict visible everywhere on this planet, there is no evidence a humanly devised, spontaneous eruption could provide the answers we desperately need. And that’s merely the start. Every created wonder, great and small, confirms that indisputable fact. So much so that, contrary to all no-God theories (including the delusion of a spontaneous bang), the psalmist could say with accuracy and confirmable authority, “The fool has said in his heart, ‘There is no God’” (Ps. 14:1). Moreover, God is (contrary to Hawking’s thinking) someone we can meet and, by prayer, legitimately ask any questions we want to ask. That intimate relationship became available to all who believe because of the deliverance brought to us through the redeeming sacrifice of Jesus Christ. “Behold, I stand at the door and knock. If anyone hears My voice and opens the door, I will come in to him and dine with him, and he with Me” (Rev. 3:20). In or out. That’s the choice.